Do you still play Guitar Hero? Drum Hero? Band Hero!? Or are music games with plastic instruments dead to you now? Games blog Kotaku poured cold water over the suggestion that Ubisoft are about to release yet another version of Guitar Hero – this time called RockSmith – and stated that the age of the music accessory game is over. Last month Activision pulled the plug on their once very successful Guitar Hero franchise, laying off 500 workers and putting the cuts down to “continued declines in the music genre”. 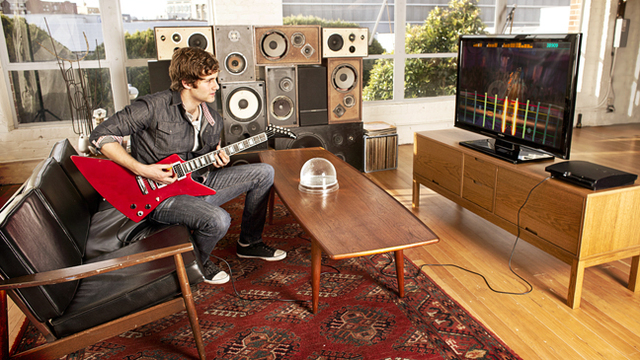 The twist with RockSmith is that you plug in a real electric guitar: no plastic instruments here – the game just comes with a jack that allows users to plug an electric guitar into an Xbox 360 or PS3. You can buy the electric guitar too if you need to – and the whole lot will cost you $200. I don’t think these style of games are dead at all. I say long live guitar hero! Its a heck of a lot of fun to play them at a party or big gathering.